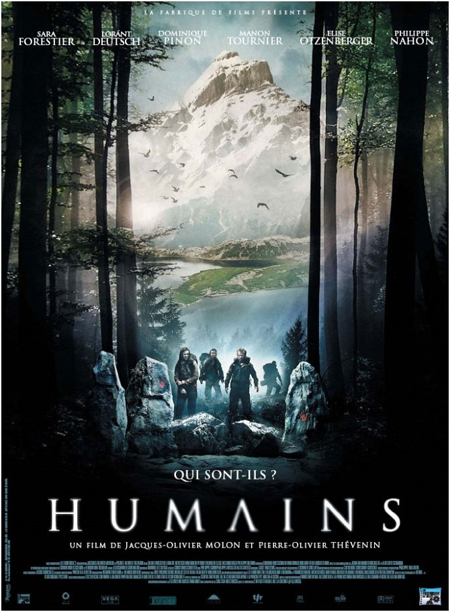 This is a big week for 2007/2008 Filmaka Feature Film finalist Pierre-Olivier Thevenin as his first feature film HUMAINS opens in over 100 theaters in France. He received this directing assignment because the producers at La Fabrique de Films watched his Filmaka short films “Yum, Yum” and “Thanksgiving.” The films had been forwarded to La Fabrique de Films by Thomas Augsberger, a Filmaka co-founder. In fact, Pierre-Olivier had to pass on participating in the final round of Filmaka’s feature film competition because he was in pre-production for HUMAINS. Plot summary: A team of several researchers travel to the Swiss Alps to investigate a scientific discovery on human evolution. The trip, however, turns into a deadly fight for survival when the team crash into a gully and find themselves falling prey to someone…or something. How were you selected to direct Humains? “Humains” was originally a 30-page script written by a French and a Swiss scriptwriter. This was then presented to the producers, Franck Ribière and Vérane Frédiani, who appreciated the originality of the concept and decided to ask the two scriptwriters to give them the first complete draft. Subsequently, they approached my colleague and me to direct the film, having already worked with us on the special effects of their previous film. Of course, the fact that they saw the two short films I directed for Filmaka greatly helped in my being chosen. How did your Filmaka short films help you get this assignment? The producers were already very familiar with the concept of Filmaka, and helped out by promoting Filmaka to their contacts. In return, Filmaka drew their attention to my two short films, “Yum Yum” and “Thanksgiving”. Thanks to the two films which really amused the producers, and the strong recommendations of Filmaka, they were finally won over and hired me to direct the film. How much time did you have between getting the assignment and the beginning of the production? We understand you had to pass on participating in the final round of Filmaka’s feature film competition. There was a lapse of almost one year before we began the production, mostly due to the numerous financial and administrative difficulties. We had considered quite a number of countries for the shooting, including Canada, France and Romania, but the film was finally shot in Switzerland and Luxemburg. Following an important scientific discovery that could question our understanding of the evolution of Man, Professor Schneider and his son leave for an expedition to the Lötschental valley in the Swiss Alps, accompanied by a young palaeontologist, the professor’s favourite student. Along the way, they meet and travel with a family of tourists who are there for the famous Lötschental carnival and its Tschägättäs. The seemingly fun trip then takes a very unexpected turn…. I would classify this film in the adventure genre for the general public. It has a bit of humour and action and a touch of fantasy. What did you find most exciting and challenging about directing your first film? The biggest challenge was in adapting a story written by many hands in which there were many heterogeneous elements. As a result, the story has a certain unique adventure feel to it that makes it amusing without being comical, and exciting but not scary. In addition, the actual shooting of the film was not without its own difficulties, mainly because most scenes were shot outside at different locations in the forest/mountains. Consequently, drawing up the work plan to fit everything in and transporting all the equipment to the various locations (some of which were inaccessible to vehicles) proved to be somewhat of a headache. What was it like attending the premiere and having a packed audience react to your film? It was rather intimidating actually, especially when we had to present the film in front of hundreds of people. However, the Q&A sessions were far more enjoyable and I could see that the moviegoers were really interested by what they had just seen. Humains opens wide in France this week. What’s next for the movie? There are 112 copies of the film that will be distributed across France. For comparison’s sake, a blockbuster usually has about 600 copies, and a small film has between 20 and 70 copies. As you can see, Humains is in the lower-middle range, but I think this is reasonable as it’s my first film. How did you find out about Filmaka? Well, actually, I received a mail one day promoting the Filmaka site and decided to take a look. At the beginning, I must admit that I had doubts over the seriousness of the site, mainly because the prestigious jury, complete with financial rewards for winning short films and a promise of a long feature for the final winner seemed too good to be true. But when I studied the details of the competition, I realised that it was really a serious one and decided if I wanted to direct a short film, it was now or never. Tell us about your short films Yum Yum and Thanksgiving. Yum Yum is my first short film and I spent one Saturday afternoon writing the script. I then took the following week organising everything and getting people to come (at short notice). The weekend after, I shot the film with the actors who were friends of my mother’s and who were into theatrical acting. The filming was very fun, especially since I made the actors eat lamb brain and pork intestines…. Thanksgiving had a more complicated filming process, as I wanted a cartoon-like look to it, so as to make it even loonier. As such, I had to have an entire set made with recycled wood and stuff. The problem was that the day before the actual shooting, the set was far from being finished, and even with the reassurances from the set decorator that all would be finished the next morning, I had my doubts. Unfortunately, the next morning, as I had feared, the set was only half-finished. As a result, I had to reorganise the work plan and shoot the angles where the set was finished, while the unfinished portions were being built (just beside us). How did the experience in shooting your short films help you when you directed your first feature? It helped me learn how to manage a team of actors and technicians and gave me a bird’s eye view of the entire film making process, beginning from scriptwriting to shooting the film and ending to the final mix. Any advice for Filmaka members? The three-minute limit is a real challenge for the recounting of the story. You should treat this limit as an exercise to show that you know how to tell a story within three minutes, while still staying creative. And if you fail, no one will blame you, because you’re competing with yourself and not with others. Just try again and again, until you succeed! For Humains, I co-directed a script that I didn’t write. While it was interesting and enriching in itself, this experience made me really want to write the script as well for my next project. So I’m currently developing my ideas into a script that I will direct alone.